Although harvest has begun, it has been fraught with difficulties thus far. 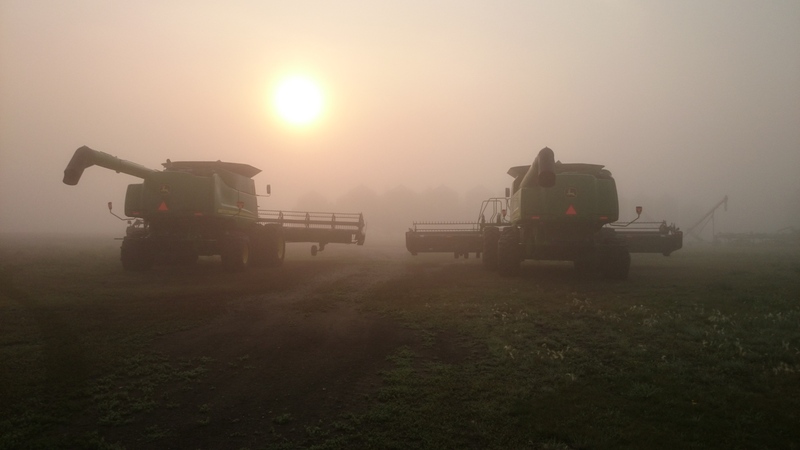 Humid, foggy nights and rain have plagued us so far, with over a week’s worth of combining only resulting in a short 750 acres completed. For 3 combines, that is pretty sad. We began our harvest last Tuesday in winter wheat, the first crop to be mature. It was a difficult decision to combine it at all, considering its stubbornly high moisture content that refused to come down. Generally, we should be harvesting wheat at 13.5% moisture. That is what our buyers want, and that is often what our contracts stipulate. Any higher than that, and we may be on the hook to pay a drying fee, which can become quite costly. Our wheat was coming off between 15 and 17.5% moisture, which is about as high as we can safely store. Normally, we would just wait a couple of days for the moisture to come down. This year, cloudy, cool days with incredibly humid nights and fog persisting well into the morning simply would not let the wheat dry down. Making matters worse was a forecast for substantial rainfall for the coming weekend. We were left with little choice but to harvest it anyway. Some farms do have the ability to dry their grain themselves, with an on-farm drier doing the same work that an elevator would do. However, we really haven’t ever needed one of these systems, and they are very expensive, both to purchase and to operate. Consequently, we do not have one, and it is pretty late in the year to get one installed now. Not to mention that the cost of one is pretty prohibitive to us at this time. Someday in the not-to-distant future, we should probably look at a drying system, but one thing at a time here. Many a farm has gone broke from buying too much too fast. Anyway, tangent aside, the high moisture content of the winter wheat kept us from combining too much of it. Our hope is that the wheat we have off should blend out just fine with some drier stuff later on. Maybe we’re being optimistic? I should hope not; if we can’t harvest drier winter wheat than that we will have some serious problems! So we harvested some short days, in between some showers, and finished off about a third of that crop. On Friday, we decided we had done as much as we dared to do, and thought our peas might be a safer bet, which should have been ready by that time anyway. Switching combines over to peas is no five minute job. You see, a combine threshes grain via a large, spinning cylinder that runs most of the length of the machine. This is called a rotor. Not all combines run this design, but ours do. The rotor runs on an angle, dragging the crop up and around itself. Surrounding the bottom of the rotor at its front are semi-circular plates. These steel pieces, rather logically called concaves, are open all along themselves with steel wires closing most of the open space. The wires are spaced out just enough to let grain fall through. So to recap, the spinning cylinder (rotor) spins pretty fast against semi-circular, partially open plates (concaves) smashing the crop between them. This breaks the pods, heads, or whatever else plants produce seeds inside of and drops the grain down below, where it is carried up to the grain tank, or hopper (there’s a few more steps in here, but you get the gist). Anyway, peas are very large seeds, and will not fit between the wires on normal concaves. Therefore, when we switch to peas we have to switch out the concaves. These things are heavy. It is no small job to do this, and it does use up some time (along with some skin and blood, usually). 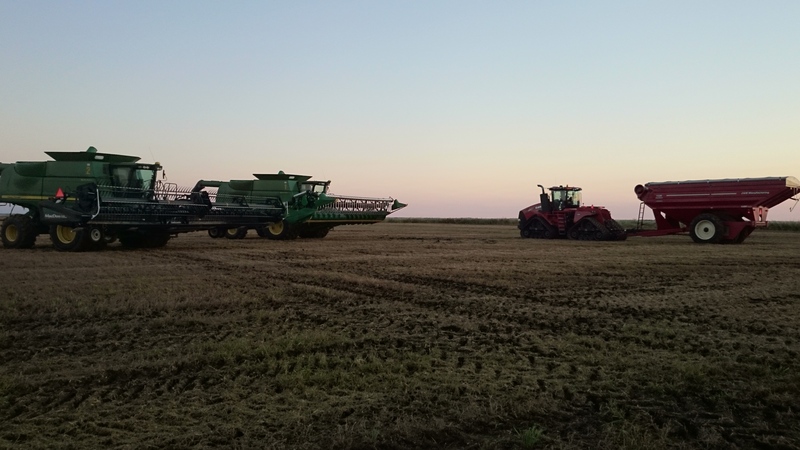 So, by the time we got this job done on Friday, it had already started raining, so that ended any thoughts of starting on the peas last week. The rain on Friday was part of a massive system that was advertised to produce substantial rainfall for us. At this time of the year, rain is not welcome. Ripe crops lose their color to washing out from the rain, ripe seeds can sprout, and fields become difficult to move heavy equipment around in. All in all, rains during harvest simply cost money and cause even more stress in an already stressful time of year. 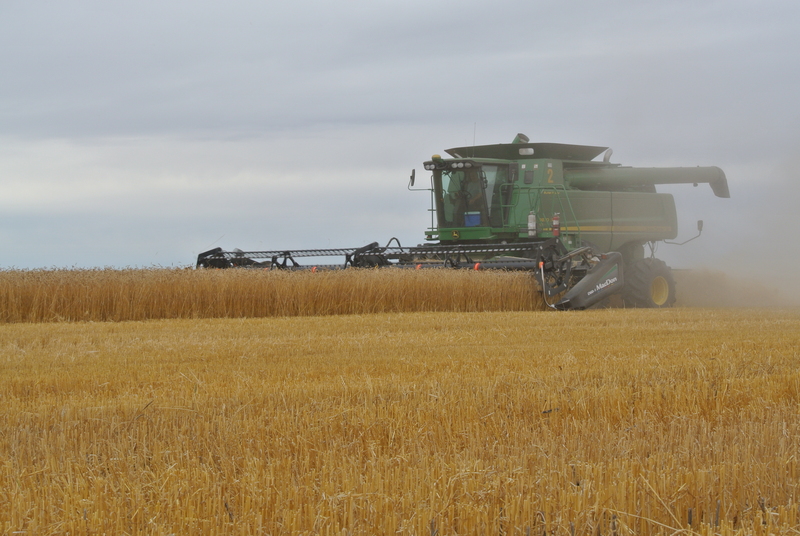 Quality losses in crops like durum and lentils can be very costly. Depending on the field, we received anywhere from 1.5-2 inches of rainfall from Friday to Sunday. While that was ugly for us, I must say that I know other farmers who fared far worse, with some rain totals reaching over 4 inches. It has been quite a few years since we had an event like that on our farm, and I remember it vividly. Long story short, it was not fun, and we had a lot of stuck machinery that year. Harvest was long and miserable. Harvest is not always hot and sunny, like it has been the last few years. No, 2010 was the last year that harvest was wet… and it was ugly. We hardly turned a wheel throughout the month of September. By the time we could go, our crop quality was terrible, and a lot of yield had been lost. It was an incredibly expensive month for us and others in the area. That was 4 years ago… maybe it’s our turn for another one like it. I sincerely hope not. Fortunately, things have improved somewhat, and harvest has resumed. We hammered through our peas and are now ready to move back to winter wheat and maybe lentils. It feels good to check a crop off the list, even if it is a small one in terms of acres. We will be changing concaves again in the morning (I’m just so excited for that job) and hopefully we can get started early. There is the potential for rain tomorrow afternoon, so it will be vital to get going as early as we can. With a wet September in the forecast and days already growing noticeably shorter, we will hammer down as hard as we can whenever we can. I have a strong feeling that this will be a difficult harvest. But… I’ve been wrong before (often, actually!) and, bad weather aside, harvest is still the most wonderful time of the year. Next Article Why is Rain Such a Problem at Harvest?